But for the guns, thousands of Americans would be alive today to live their lives as the rest of us are doing. They would be singing, dancing, working, studying, playing, shopping, eating, loving, reading books, traveling, and just living. Mr. Johnson, a 19-year-old who loved to sing and dance, who was an athlete and a budding social activist, will not get to see that vision realized. He was shot and killed Wednesday after playing basketball near his home. Delmonte Johnson, in red, with his family in an undated photo. Mr. Johnson’s death was tragic and unnecessary and enraging. It was also the sort of death that’s become far too common in America, and in particular in Mr. Johnson’s hometown, where more than 2,000 people have been shot so far this year, nearly 400 of them fatally. While mass shootings involving high-powered guns and high death tolls have claimed an outsize portion of the nation’s collective grief — and its headlines — street shootings like the one that killed Delmonte Johnson are far more common. Amber Guyger, who is white, was off-duty when she shot Botham Shem Jean, a black man, in his apartment, police said Thursday. Guyger told police she thought she was entering her own apartment not realizing she was on the wrong floor. Upon encountering Jean, she thought her home was being burglarized and opened fire, according to police. Botham, a 26-year-old native of St. Lucia, was unarmed. He died at a hospital. Social media users balked at the suggestion that a gun could have saved Jean, who was born on the Caribbean island of St. Lucia. “If Botham Jean had a gun and killed a police officer he’d be in jail held without bond and Trump would be nonstop tweeting about that immigrant who killed that poor cop,” Comedian Sarah Cooper tweeted in response to Loesch’s remarks. Sometimes the NRA’s line of reasoning is so ridiculous as to be unbelievable and totally unhinged. As if people are sitting around in their own apartments armed just in case someone happens to come in who doesn’t belong there and, of course, be totally prepared for a cop with a gun. ( Oh right- that is what the NRA and gun rights advocates believe). I think they can retire this argument. It makes no common sense and it’s stupid. Castile is the mother of Philando Castile, the Minnesota public school employee who had a valid concealed carry permit when he was shot to death by a police officer during a routine traffic stop in Minnesota two years ago. “My son was a licensed gun owner and it didn’t help him. He’s dead because he gave that information to an officer,” Castile said in a phone interview Wednesday. Castile called Loesch “reckless” and “one-sided” for using Jean’s tragic death to further the NRA’s agenda. “(Jean) was in his own home. Inside a nice building with security. He had a right to feel safe in his own home. He wasn’t expecting someone to come in uninvited. He shouldn’t have to always keep a gun on his hip. That’s asinine,” Castile said. “That officer was dead wrong. Just hold her accountable. Don’t try to spin the story. My son was a good guy, and (the NRA) tried to spin it. The truth is, he’s dead for being honest and telling the truth,” she said. Reckless is a great word for the NRA’s claims. Loesch was actually suggesting that Jean should have shot a police officer. What would have happened then? A black man with a gun shooting an officer? Stand your ground laws don’t work out so well for people of color. It’s the guns. It’s actually the bullets from the guns that are killing all of these people-mostly innocent of wrongdoing but now dead. California wants to do something about the bullets. That liberal bastion of a state has managed to pass some of the nation’s strongest gun laws and also has one of the lowest gun death rates in the country. Gun rights advocates love to criticize the laws in California because they don’t seem to stop all shootings. But they have it all wrong. What is going on in California is saving lives. California has lower gun death rates than most other states. Let’s review. Firearm deaths account for the majority of overall homicides in our country. 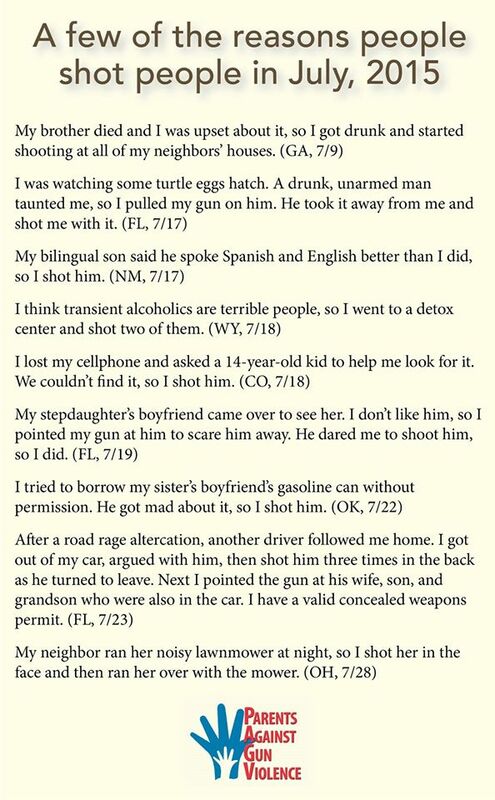 Guns make a difference. Suicide by gun accounts for the majority of overall gun deaths in America. America has more mass shootings than any other developed country not at war. America has more guns per capita than most other countries and the most gun deaths per capita. And I want to end by remembering the victims of the Washington Navy Yard shooting that occurred on this date 5 years ago.. The government contractor who killed 12 people at the Washington Navy Yardlast week was driven by delusions that he was being controlled by low-frequency radio waves and scratched the words “End the torment!” on the barrel of the shotgun he used, the FBI said Wednesday, offering new, chilling details of the attack. In America, people like this have easy access to guns. 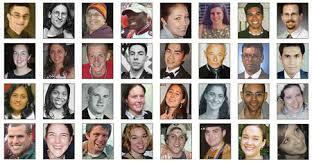 Let us all take a moment and remember the victims. It’s the guns. We can’t avoid the truth. But then, for some in today’s American political craziness truth is not truth any more. It doesn’t have to be this way. Stand up for the truth and for action. Tell your candidates you want them to do something about gun violence. And by that I mean do something. Don’t pander to the nation’s large corporate gun lobby. It’s a paper tiger. The majority of Americans do actually understand that we have a serious problem with guns and loose gun laws. First, in this case it would be the Castle Doctrine since this occurred in his home. People of color are protected by stand your ground laws at about the same rate as white people. • Whites who invoked the law were charged at the same rate as blacks. • Whites who went to trial were convicted at the same rate as blacks. • In mixed-race cases involving fatalities, the outcomes were similar. Four of the five blacks who killed a white went free; five of the six whites who killed a black went free.